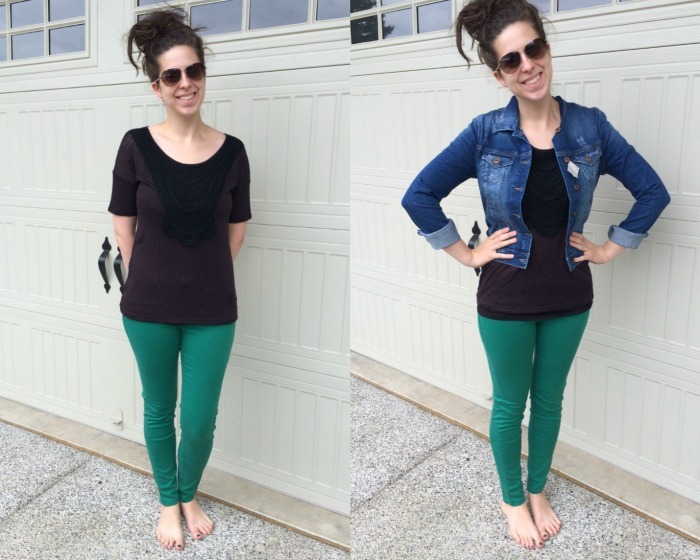 Not familiar with Stitch Fix? It’s a personal styling company perfect for busy mamas who don’t have time or energy to search for quality, timeless pieces for their closet. It arrives in the mail whenever you want – monthly, quarterly, once a year – no long-term commitment, no membership fee and you can easily return whatever you don’t choose to keep in the prepaid envelope. The concept (and the treasures in each box) is brilliant! Complete a style profile here, it takes about 15 minutes to notate your size, style preferences, budget, lifestyle, etc. You can even submit the link to a style board on Pinterest! Schedule the date you want your fix to arrive – depending on how busy they are, it’s usually about a month out from when you complete your profile. Your fix ships, you get to try on each piece in the comfort of your home and then return whatever you don’t like or doesn’t fit. They even include a styling guide for each piece to give you ideas on how to put together outfits with your fix items. After you make your final decision you complete a simple checkout online – marking what items you are keeping and giving feedback on everything you received. Was the price right? The size? The style? And then a blank box to add specifics like “too tight on the tummy” or “how did you know this color would look perfect on me!? !” If you keep everything in your box you save 25% off everything! Cool bonus, right? Alright, now … a peek at my fix! 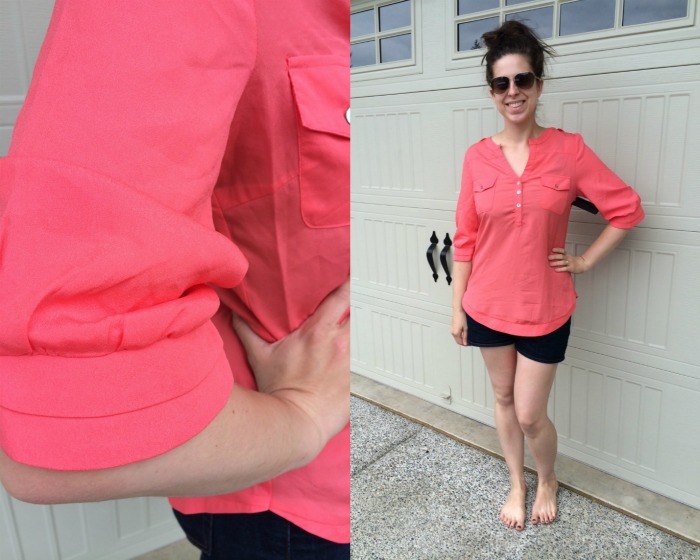 Loved the color and the fit – plus, the sleeve details were just too darling! AND, breastfeeding accessible which I noted on my style profile as being my preference for the majority of the pieces in my fix. Beautiful detail, great length and well, I wear black often so a pretty black tee is good by me. Plus, I’m starting to prefer scoop necks over v-necks these days. How did my stylist know I’ve had my eye out for a new denim jacket? My current one is a lighter denim and from my high school days. This one. THIS ONE. I’m absolutely in love! It’s as soft as butter, lightweight while still being structured with just the perfect amount of stretch. It was a little more than I’d normally spend, but I know I’ll wear it often and have it forever so … justified. Emerald green skinnies welcome to my life! Again, great structure, fun color, stretch and mom-rise (also known as – no tummy roll or peekaboo bum). Paired with the Ezra black top and Mavi jean jacket. I want to share my note from my stylist to give you an idea of how they pay attention to detail. I know, I know – it’s like my stylist and I are totally friends! I’m so pleased with everything she chose for my Fix! I earn a referral credit if you begin your Stitch Fix through my link – so if you’re curious, sign up here. The worst case scenario is you spend $20 on your styling fee. Best case, you find a piece or two (or five!) to complement your closet and amp up your mama style! And remember, the styling fee applies to whatever you keep. There is no doubt in my mind that Stitch Fix gets better and better as the stylists learn more about you. 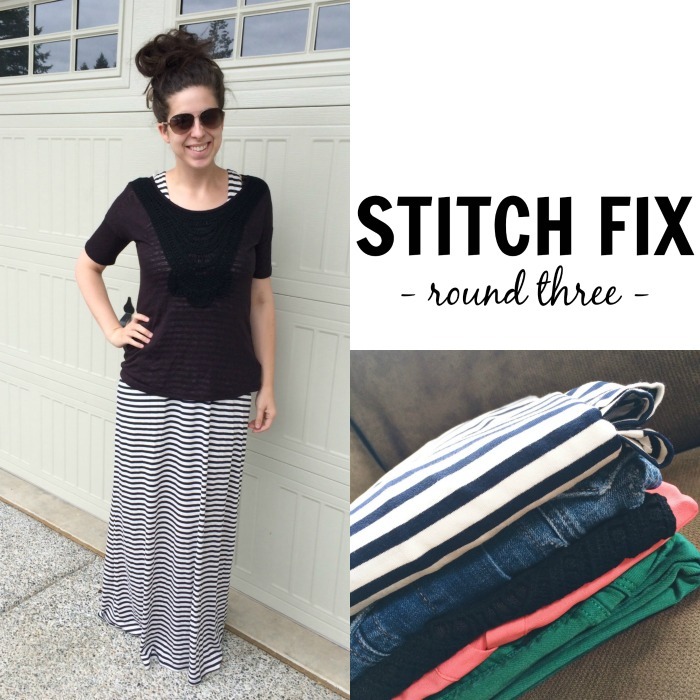 Take a peek at my first and second Stitch Fix boxes if you like. I can’t wait to see what treasures my next box holds – I scheduled it to arrive right before my birthday in October!